You won’t find this in any medical journal, but candy seems to be somewhat of a cure-all. It can cheer you up when you’re feeling down, it can sate your sweet cravings in an instant, and it’s the perfect touch to any special occasion. If you’ve got a sweet tooth you just can’t control, head to one of these 10 best candy stores in Georgia. Handcrafted sweets for every occasion, you’ll want to taste their full gamut of gourmet candies and chocolates. With a huge variety of homemade fudge, barks, chocolates, taffy, and their world-famous Chattahoochee Snappers, you won’t be able to walk out empty handed. Best of all, if you can’t make it all the way to Helen, you can order their sweets online and have them shipped to your door. It doesn’t get any sweeter than this. Specializing in gourmet candies, nuts, and chocolates, River Street Sweets is the perfect treat to make your day a little sweeter. From gift boxes and tins to saltwater taffy and homemade fudge, the focus here is on high-quality edibles that look every bit as good as they taste. They’re quickly opening more locations along the East Coast, so if you can’t make it to the Savannah store, guests can get their fill at more than a dozen other locations. As colorful as they are tasty, this shop is brimming with sweet gourmet lollipops, gummies, and all the chewy candies you could imagine. Aside from their candy confections, they also specialize in baked goods, old-fashioned handcrafted milkshakes, and their famous stuffed cookies. Go for a cocktail-infused boozy bundt cake or a lolli kabob—you won’t regret either. For a dose of nostalgia with your sugar rush, head to the old-fashioned Dahlonega General Store. Here you’ll find all your classic favorites, like rock candies and candy sticks, along with other timeless general store staples. It’s a step back in time you’ll want to experience first hand, but you can also order online if you don’t have the time to travel here. One of four locations in Georgia, Rocket Fizz is reminiscent of an old-school soda fountain. The ideal locale for bulk nostalgic candies, vintage t-shirts, and every flavor and style of soda you can imagine (bacon-flavored soda, anyone? ), this is the perfect place to fuel your sugar rush. If you’re looking for sugar in its finest, empty-calorie form, there’s no better place than Hey It’s Candy! 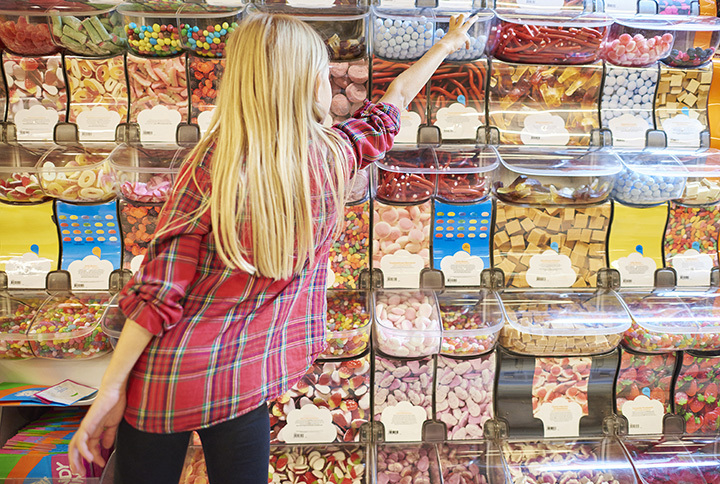 They feature more than 200 varieties of candy available in bulk or just for a sweet pick-me-up. And if you’ve never tried the wonder known as pucker powder, it’s an absolute must before you leave this store! Being a true sweet shop, you’ll find much more than candy within. This store is chock full of delicious taffy, fudge, chocolates, and nostalgic candies that make the perfect take-home gift for family and friends (or yourself!). In addition, they’re well-known for their fresh, all-natural, made-from-scratch gelato that no visitor to this shop should leave without tasting. If you’re looking for homemade candies and chocolates, this shop has plenty to delight your taste buds. From chocolate-dipped Oreos and butterscotch haystacks to fudge and truffles, you won’t fresher flavors anywhere else. Take advantage of their fill-a-bag option that lets you choose your bag size and fill it to the top for one flat rate. If you’re looking for a tasty gift, head to Greene’s Fine Foods and choose from a variety of beautifully crafted gourmet food and candy arrangements. In addition to classics candies like gummy bears and Jordan almonds, you can choose from nut varieties, chocolates, and beer and wine selections. Every item is perfectly packaged to make a good presentation for your recipient. Located in Ponce City Market, this throwback candy shop has all the sweets from your childhood. You’ll find all your favorite sugary candies, chocolates, and chewy candy alongside vintage-style root beer and other old-fashioned bottled sodas. It’s also a prime destination for larger-than-life candies—go for the giant gummy worm!